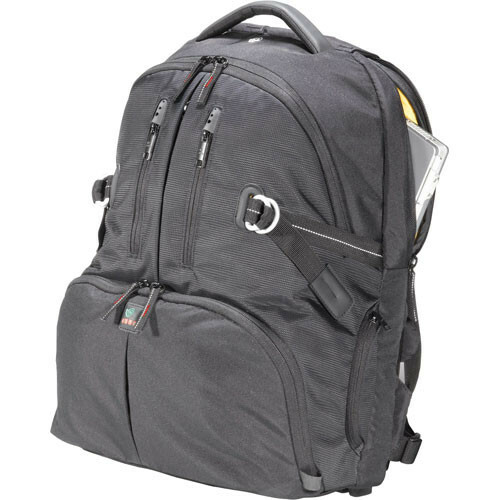 The Kata DR-467 Digital Rucksack (Black) features TST RIB structural protection for up to two digital SLR cameras, with one mounted lens, 2-3 additional lenses, flash, accessories, laptop computer with a screen up to 17", and personal gear. The padded bottom camera insert can be removed to convert the rucksack from a camera bag to a daypack when you're not shooting. The main compartment holds a digital SLR in top grip position, while the modular dividers system will separate, organize and protect lenses, flashes and other accessories. The large top compartment will hold personal gear or additional equipment, and the internal pockets and MP3 player pouch will allow organization of personal effects. There are external pockets that allow quick-zippered access to supplies, and a water bottle/ tripod support pocket pulls out from a side pocket. The included yellow Elements Rain Cover folds neatly away into an integrated pocket. It can be hung out to dry on the small buckle next to the handle, or tucked away for storage in one of the pockets. The bag is carried by a carrying handle, backpack harness, chest belt and balancing waist strap. TST (Thermo Shield Technology) rib structure provides protective zones for the camera where it will most likely be impacted by shock and vibration. The included yellow Elements Rain Cover folds neatly away into an integrated pocket, and can be hung out to dry on the small buckle next to the handle, or tucked away for storage in one of the pockets. When in the sun, reverse the cover to prevent your equipment from over heating.